Ground penetrating radar (GPR) is a geophysical method that uses radar pulses to image into the subsurface. This nondestructive method uses electromagnetic energy in the microwave band (UHF/VHF frequencies) of the radio spectrum, and detects the reflected signals from subsurface structures. 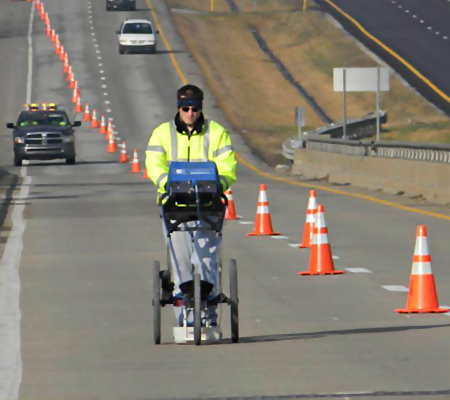 GPR uses multiple FCC approved high-frequency radio waves, usually in the range 10 MHz to 2.6 GHz. A GPR transmitter emits electromagnetic energy into the ground. When the energy encounters a buried object or a boundary between materials having different dielectric constants, a potion of the propagated energy is reflected or refracted back to the surface. The reflected radar energy is then detected back at the surface by a receiving antenna and converted to electrical signals, which correspond to minor changes in the voltage. The signals are sent to the control unit, amplified, and recorded. These recorded signals are then sent to a field laptop computer and a real-time two-dimensional depth profile is constructed. From the depth profile, features such as subsurface utilities, pipes, voids, structural reinforcement, conduits, and/or other obstructions may be interpreted and located in the field. Ground Penetrating Radar “GPR’ can have applications in a variety of media; including rock, soil, pavements, concrete, fresh water, ice and other structures. In the right conditions, practitioners can use GPR to detect subsurface objects such as underground utilities, electrical conduits, voids, and structural reinforcement including rebar and post-tension cables. Dielectric changes in sub-surface material properties may also allow GPR to determine pavement layer thickness nondestructively with very little data post-processing. With the latest advancements in GPR technology, traditional pre-construction surveys are no longer cost-efficient. Older methods like, drilling, coring and x-raying can lead to costly utility, environmental, and property damage before the work even begins. Everything you need to know about what lies beneath the ground can be mapped out on our FCC approved ground penetrating radar equipment before you ever scratch the surface.